Ashley grew up in Lithia Springs with many pets. 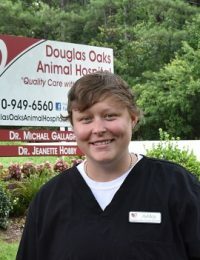 Ashley started volunteering at the local shelter when she was in high school and knew then she wanted to work with animals and started in the veterinary industry in 2016. Ashley loves hanging out with her friends in her free time and playing outside with her dogs, Kunu and Joplin.